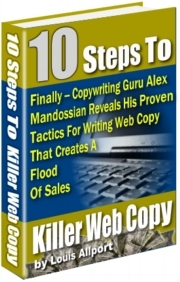 "Louis, I didn't know how a person could possibly make a six figure income from a web site that gets less then 200 visitors a day but Alex shares it all in this interview. If I had paid 5 times the price for this in-depth interview I would think it's worth every penny. At the price you offer it for it's an absolute steal. I thought I knew a lot about on line advertising but Alex's insight about taking off line techniques on line has opened my eyes. Alex pointed out a HUGE mistake I'm making on my site that I estimate has cost me thousands of dollars in lost sales. I only wish I'd had this insight sooner." If for any reason at all, at any time at all, you would like your purchase refunded, no problem. I want you as a happy customer.